Want to learn how to start a painting business without having much money? I started my painting company in 2010 with $200, and in 2014 we sold over $1,000,000 in house painting. Over the last 10 years I’ve helped hundreds of others start a painting business. Of course there are many different ways to start and run a business. I’m going to show you how to start a painting business legally, and what I believe is the most efficient and cost effective way to start making money. Checklist to starting your business – Make sure to set everything up correctly and legally, including where to do it all. This stressed me out when I was starting. Goal setting sheet – It’s important to set attainable goals so you have some direction. $1,000,000 Business Blueprint — So you can see what it looks like from a high level. There are two steps to registering your business. First, you need to register with the Secretary of State. Each state has a different website for this. You’ll want to file a new document and go through the process to establish your business. I set up my companies to be an LLC, which is what I’d recommend. Second, you need to get a Federal EIN number. 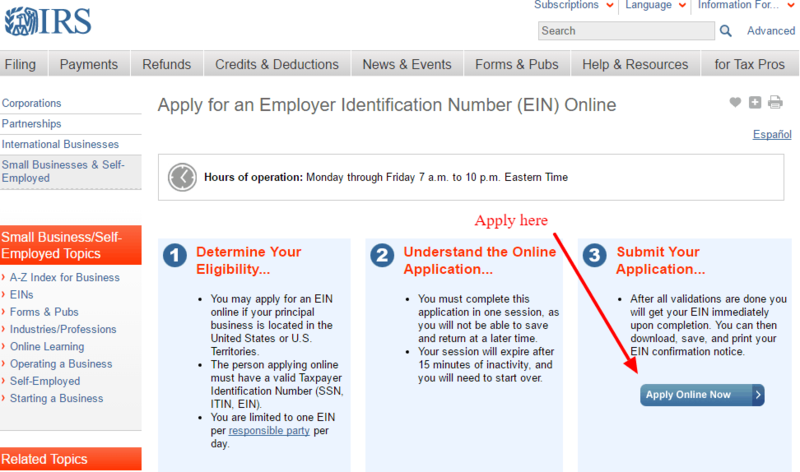 Search “Federal EIN” (or visit website here) and click on the IRS page that says “Apply for an EIN”. Go through all the steps to apply for your EIN. This is your Employer Identification Number which is used to set up your bank account and file taxes. Once you have your Articles of Organization from the Secretary of State and your Federal EIN from the IRS, you can go to the bank with those documents to set up your bank account. Costs will vary state to state for filing your Articles of Organization. Depending on your bank, you may need to make a small deposit to open your business account. Every state has different requirements for a painting business license. In some states, like Colorado, you don’t need a license to legally run a painting company. Other states, like California or Michigan, have a lot of steps that you need to go through in order to obtain your license. You’ll need to find out what those requirements are. Insurance requirements can vary state to state as well, but it’s fairly standard to have $1,000,000 in general liability insurance and $1,000,000 per each occurrence. I’d recommend calling around to local insurance companies and let them know you are starting a painting business and need liability insurance. Some insurance companies don’t do this type of insurance, so you may need to call a few places. Get quotes. When you’re just starting out, it shouldn’t cost you more than $100/month for your insurance. Workers’ comp requirements also vary state to state. You can find these requirements out best by starting with a Google search and then contacting local government offices if you need to confirm the requirements. What you need to buy depends on a few factors. Do you already own equipment? Are you going to be doing the work yourself, or hiring employees? What is your budget? Are you going to be using employees or sub-contractors? If you choose to use sub-contractors, you won’t have to buy any painting equipment. The only equipment you need to buy is marketing and sales materials… maybe a brush for doing color samples for customers. If you choose to use employees, you need to buy all of the necessary equipment to paint a house. This can add up to around $500-$2000 depending on how much money you want to spend. Anything you don’t buy, you can usually rent for a per-day rate. You can also check out this great article that covers all the painting equipment you need, plus recommendations on specifically what to buy. Ladders: 8′-12′ and a 28′-32′ sizes. $100-$300. Brush: one brush per person. Don’t go cheap on brushes. $15-$25/brush. Roller heads: lots of options, see what you like best. Roller Tray: size to fit the size of roller you bought. Masking Gun: Not necessary if you are not purchasing a sprayer. This is to mask off windows, doors, roofline, etc. It is absolutely worth the $50 with how much time it saves you masking things off. Sandpaper: 60 to 80 grit sandpaper for sanding down the peeling areas. Get a few sheets. Like I mentioned earlier, consider hiring subcontractors to do the work for you. Talk to friends and family – then get referrals from them. It’s easier to sell work to referrals than to acquire new ones. Make a free Facebook page – reach out to friends and ask them if they need any work done. Print a few hundred flyers – 4 per page, and go door to door. This is how I got my first 4 jobs. I knocked on doors and said “Hey, I’m Eric with Foothills Painting. I noticed some peeling paint on your house. Would you like a free estimate?” Cost: $100 — for the flyers. Expensive route: Review my article, “Painting Leads: Marketing a Painting Business” and basically do everything on that list. You could spend about $3,000 per month on marketing. Middle of the road: Start with the pay per lead services listed in that article. This way you can manage your budget. Use the free website route, and make your own website. There are companies that make that very easy to do. Once you start getting people who are interested, you are going to need to give them an estimate. Pre-made templates client manuals are in my Painting Business Pro course. Just by having a client manual you will already look more professional than 90% of the other painting companies giving estimates. I’d also recommend creating a basic contract (also in my course). I made it on Excel and it shows people the areas of the house that are included in the estimate, the materials included, the prep work included, other notes, and the prices and options. There’s also a place to put the total job size, the deposit, and where the customer can sign. Once you have all of your materials… start generating leads. Call those people who want estimates, and set up a time to meet with them. You’re also going to need a really good sales process. In the painting business starter course, I’ll teach you everything you need to make sales and provide you with all the scripts, templates, and training you need to be successful. Everything up to this point, almost anyone can do. But when it comes to actually getting jobs booked – that’s where people start to fall short. Meet with the customer, find out what they need and want, answer their questions, walk around the house with them, recommend solutions to the problems on their house, and come up with options to write up for them. Estimate the job and come up with your prices. Write up your estimate. Present it to them. Ask for the job. Take a deposit. This will help you start making money faster, and cover some of your material and startup costs. To properly estimate the cost to paint a house, you need to know how much the labor will cost and how much the materials will cost. Once you know that total cost, you need to add in your mark-up or your profit margin. Using a sub-contractor is the easiest thing to do (and the cheapest) because you don’t have to purchase materials and you don’t need to train them. These are people who own a painting company, and instead of going direct to customers, they get work from people like you… people who have jobs already, and want to hire a sub-contractor to do the painting. Hiring employees is the most difficult, because you need to learn how to hire the right people, you need to train them, then you need to manage them. You will also need to provide all of the equipment and materials. You also need to process payroll and deal with payroll taxes. All of these things can be avoided by hiring a great sub-contractor. Doing the work yourself lands somewhere in the middle. If you have previous painting experience, it is a great way to make a lot of money right away. You can bid the jobs lower because you are doing them yourself… but don’t make that a habit. If you are going to do the first few jobs yourself, that’s fine. Plan to move towards having other people do the work by your 4th or 5th job at the most. The way to succeed in this business is by doing a lot of revenue. It’s hard to make much more than $50,000-$70,000 a year if you are doing all the painting. Not to mention, it’s very hard work on your body! Revenue minus expenses = profit. The total amount the customer pays you, minus all of your expenses is what you are left with – this is your pay. We don’t care about the initial startup expenses, we care about the expenses per job. These costs per job include the materials, the labor, and any other other non-reusable materials you use on the job. It could also include any marketing expenses you incurred to get this customer. But more marketing means more business. Andrew – just saw this post. Somehow I missed it. Contact me on the contact page if you have something you are interested in talking about. Thanks! Thanks for the information.I have beenvpainting on and off again for the past 20 yrs.And have seen alot of different type painters.Which makes me interested and believe I should do good and be successful at a painting company. I’m 41 wasted alot if time working for people in the construction field. Because the money was always good I believe that’s what made it hard for me to see what would be more secure for my family’s future.Until the past7 years with alt of life’s situations and bad buisness choices on the company’s owner not the help. It’s put me in a bad situation financially a time or two.I’ve took ]ride in my painting,until I was forced to help a friend out with section 8 housing wich was under the tablebwich as the last few jobs money was excellent cause painters was impossible to find good ones even though it was section 8 as I found out none of the work was really done properly.As usual family buisness never ment my family’s survival wich I’m not going to keep going on wich these are the reasons I want to thank you for your time and concern to offer help in this area. I feel that I have allot to offer this buisness and need to make this count me my fiance 5 yr old son yet old daughter,and15monthbold bsbybgirl.I’ve given so much of myself to this field to only in the end realize my family’s fait is in someone else’s hands in more ways than I realized.wich is why it’s a must for me to succeed. It sounds like it’s time for you to make this happen on your own… for yourself, and for your family. I’m glad you found my site, and I hope my articles and videos can help get you going in the right direction. Entrepreneurship is the only way to live! That name will work fine. Check out my article on naming your painting business if you want some of my thoughts on good names. I’m glad you found my site… there is a ton of great info here. If you are really serious about this business, I’d strongly encourage you to get my course. Let me know if you have any questions that come up. Good luck! hello, Eric I just wanted to thank you for the time and information you put in to this, Ive been wanting to start my own small paint business for a long time but I was like a lot of other people,i didn’t know how to get it started or even how to estimate a job.this information you give is very helpful and already learned a lot just from reading the material you provided on here and clicking on some of your links.you have been a blessing and gave me that extra push and know how to get my small business started. Great to hear Chris, thank you! I need all the advice I can get. My husband and I are professional painters and have all the equipment to get started. I just don’t have the money to hire a lawyer to get everything started. I live in Texas and need all the free help I can get to get all of my paper work in line to open. thanks for the good info.. I don’t think you need a lawyer for anything. I paid a lawyer the first time my 5th year in business. All you really need to do is register your business and start selling jobs! You should be able to find all the necessary information on the site and in my course. If you have other questions just let me know. Cheers. My bf wants to start a house painting business. He had been working for his father’s family business for over 8 years, and you know how stressful it can be to work with family, so he wants to do it on his own. We are in upstate N.Y. (Dutchess County). Do we need a licence, dba, llc formation? Can we simply file a dba and get e&o insurance? Please help there is little on the internet I can find for this area. Thank you kindly. I’m pretty sure you will need a license anywhere in New York. Google “Dutchess County Painting Contractor License Requirements” or something like that. You may need to call a couple local government offices to confirm. Licenseing is difficult to help with, because every state (and, in some states, every county) has different rules and requirements. Dutchess County is a great place to do business though. You won’t have a hard time getting work, that’s for sure. Great area, and a lot of other great areas nearby to expand into. Insurance companies can probably answer your licensing questions as well. Let me know if you have more questions. I respond faster if you go to the “contact” section on the website. Hi my name is Michael I’m 23 and have a budget of 15 thousand and I am extremely interested in starting my own painting business this website helps greatly what’s the fastest way to maximize my income in one year. My advice is this: Watch all of my YouTube videos. Read all of my articles. Buy my course. Then keep following me. I’m going to keep adding more and more high level information to come. I have more courses coming that are more about “bigger business”. But Painting Business Pro, the course, will get you all the information to build a solid foundation. I have a painting business and have been painting for over 20 years. I currently live in Indiana and I have been successful. I am wanting to sell my painting business along with several vehicles, ladders, sprayers. I also have been in this location for the past 5yrs. I have went from Zero to over 450K in Gross sales due to customer service and having an eye for detail. Due to health reasons I want to sell my Painting Business. I have been told to get a Lawyer and get all I can but I have another avenue of income and want to sell everything including my leads I have acquired. If anyone knows anyone in the Muncie, IN area please let me know. Thanks Travis 765-748-3080 I will share with them what I have to offer equipment wise. I am currently keeping 8/9 employee’s busy painting new homes, residential, restoration companies. Thank you. If you are still looking to sell your business, please contact me thru the contact page. My question is before I get my LLC .. Do I have to be required to show that I have passed some painting course or show hours of documented work through other companies ? You may need to do something like that to obtain your license, depending on where you live. Check local licensing requirements. What if I have a small job ($400-600) lined up and I don’t have a registered business, EIN, business bank account or insurance? Can I still do the job and report it later? Also, is this type of business considered a home based business? If you don’t have any of those things, the customer needs to write the final payment to you. It does no good if it’s written out to your non-existent business. If it’s that small, you probably don’t even need to report it. But yes, end of year ask your accountant. This is probably not considered a home based business, but I don’t know for sure the definitions. I also don’t have information on remodeling businesses. Let me know if you have other questions. Contacting me on the contact page gets a faster response. You will need to contact your local government office. Start with a google search of “painting contractor license requirements in new york” or something. Dig around until you can find the requirements. You got it Cosy! Glad you’re finding it helpful. There are a lot of opportunities out there. Sorry I just don’t have time to help people one on one, you’ll have to refer to my resources online. Good luck! Thanks for the kind message. Thank you for the information and videos. they were very helpful. I have been painting off and on for over 10 years and worked for a few different painters. i feel like i have the skills to get my own business started. i even do alot of work by myself. I just wanted to thank you for what you do by helping other people get started. thats what my plan is for my family is to get my own painting business started. i am always willing to learn more too and i look up to people like yourself thank you. Thanks Tony! I really appreciate it man. Good luck with your business! Partnerships can be tough. Glad you’re getting going on your own. I’d really recommend my course for you. It’ll fill in all the business stuff that you aren’t as strong with, and will pay for itself almost immediately. On and off for years I have managed to acquire my own painting jobs. 3 home interiors, 2 murals, custom curtains, and some basic decorating consulting. I’ve mostly done the work myself. I’m certain with a couple of calls I can have a job fast. However, I wish to be my own boss and go the distance and finally quit working in restaurants. I’m a little overwhelmed with all the needs to start. How can I start small then grow? I would recommend starting with my free information. If you are really serious about starting a painting business, and setting it up so you run the business (the business doesn’t run you), then I would strongly recommend looking into my program. I’ve done this with hundreds of people, walking people step by step to starting a painting business, regardless of their background. There is a process and a clearly defined system for building the business. The course will include every little detail you need from marketing, estimating, sales, production, and overall business growth strategy. You can also download a “business launch checklist” in my article section. Just find the article on how to start a painting business from scratch.